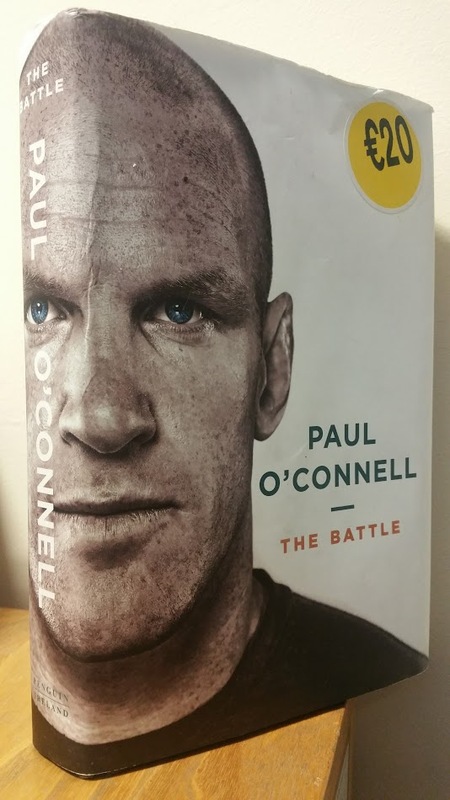 I have finally finished reading Paul O’Connell’s autobiography which is aptly named The Battle. I picked it up at the airport when it first came out and then it spent a number of weeks in my car as I didn’t have time to read. I finally had the chance over the last couple of weeks at lunch time. Anyone who has watched Paul play for Munster or Ireland might assume the name represents the battle of playing rugby. Two teams battling it out for supremacy is the definition of a battle. While there’s a certain element of that to the book title, you soon realise upon reading the book that the battle he refers to is his own internal battle with himself. It’s actually less a battle and more a fully entrenched war. We start off learning about a young Paul O’Connell who despite what you might think, wasn’t born with holding on to rugby ball. Young Paul was an astute swimmer as a boy. Even then, he showed he was a real athlete. When he was no longer the number one swimmer, he decided it was time to move on to golf but was never able to get his handicap where he wanted it. Paul came from a rugby family and played rugby on and off until he decided to fully embrace rugby moving on from Young Munster to join the senior team and eventually Ireland. We all know that Paul eventually captained not only Munster, but also Ireland as well as the Lions. His 15 year long career saw him hold up a number of trophies such as the Heineken Cup and back to back Six Nations championships. Throughout his career, Paul O’Connell battled with fitness and injuries. It was a torn hamstring that ended his career. It wasn’t just the battle with injuries though, the real battle was psychological. Every day he wondered if he was fit enough, if he was good enough. He constantly questioned his ability to be a team captain. Many of us see Paul O’Connell as an unimpeachable man of character and according to the Gift Grub persona, gives everything 110% and seeks to put the fear of God into them. Upon reading The Battle, we come to understand that Paul is really a lot more insecure than that and wishes he had never given the fear of God speech back in 2007. It’s a truly fascinating read about one of Ireland’s greatest sporting legends and I thought it was truly interesting how the book was laid out. We start out of course with Paul’s younger years before moving on to the main part of his rugby career. The last part of the book concentrates on his later years as his career is winding down but the way the book is structured changes as we move from the main autobiography written by Alan English in parts 1 to 3 to diary entries in part 4. Paul had started writing these journal entries after long talks with a visualisation coach. The diary entries span from September 2014 until October 2015 before we reach the epilogue. The question now though is whether his battle is over now that he no longer plays rugby or does it continue as he moves on to coaching? One can only hope that his years of experience and only personal war will help players overcome their own fears and misgivings.